Ever thought you’d be downloading a film strip, as a QuickTime MPEG4, no less? Here’s a good excuse: the superb bending and DIY blog GetLoFi has posted a two-part history of electronic music film strip from 1971, authored by Nick Rossi. When they say “history,” they ain’t kiddin’: the strip starts 2600 years ago. As a GetLoFi reader observes, they miss out on Italian Futurist Russo, inventor and composer Raymond Scott, and others. 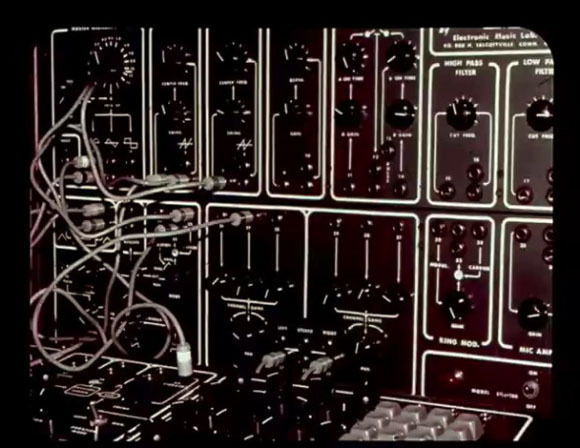 Then again, it’s great to see a history of electronic music that’s itself a part of history. Now, go watch — just be easy on GetLoFi’s bandwidth, okay? If you’re wondering who Nick Rossi is, by the way, I know he’s a published musicologist with some other similar educational resources to his name, though I couldn’t locate a bio. Sorry for the delays, gang, been a crazy week, but better late than never. And thanks, AA, keep them coming. -Ed.